Measuring and analysing test data is becoming a full days work for many engineers working in the automotive world. Storing of all this data is more and more common. Data which is required can be consulted or re-printed at all times. VLT Brake Data® is available in different modules just for storing the test results of cars, light goods vehicles and buses. For these vehicles which mainly have no large difference in unladen and laden condition, we offer the VLT Brake Data® Windows, a simple solution giving all the information you need. For those vehicles which have a greater difference in unladen and laden weight, like heavy goods vehicles, trailers, etc. we have the VLT Brake Data® Corridor Windows. This program measures the brake efficiency as tested normally unladen. The air pressure in the brake cylinder is measured at the locking point of the wheelbrakes. 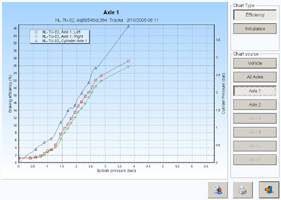 The axle weight is stored and the computer makes the calculation from the measured values still in unladen condition of the vehicle. But we also need to calculate the brake efficiency in laden condition without having the vehicle laden. This calculation is made by the computer by extrapolation of the air pressure value mostly up to 6 BAR = 85 PSI. At this point we calculate the relation between the air pressure at unladen weight in the brake cylinders at 6 BAR. 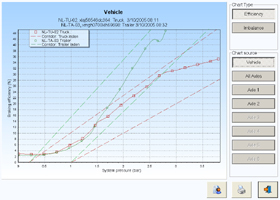 The computer calculates the total available brake force divided by the gross vehicle weight. This is the total weight of the vehicle in fully laden condition. The outcome is the brake efficiency in percentage of the gross vehicle weight.